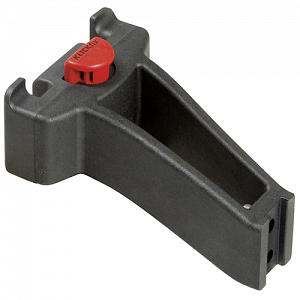 This adapter integrates the same basic elements as the "adapter for stem". However, it can only be mounted on bikes with integrated threads at the head tube. Because the adapter is fixed directly on the frame, the steering remains completely independent of accessory weight. Its new shape increases the distance to the front wheel, so that KLICKfix bags and baskets can be mounted even onto small foldable bikes. With this new adapter type, many accessories can now be mounted onto foldable bikes which have the corresponding socket. Especially well-suited for this are baskets with adapter plates of adjustable height, Freepack Meta backpacks, Shopper Minis, and all handlebar bags. Many Dahon or Tern bike models come prepared with a socket for this adapter.